Key Difference: Both are types of flatbread. Roti is generally made from whole wheat flour and is cooked either on a tawa (flat skillet) or in a tandoor (oven). 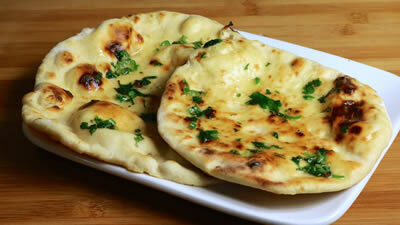 Naan is cooked from all-purposr flour, is leavened, i.e. uses yeast, and is cooked in a tandoor. Indian cooking has always been popular both with Indians and non-Indians. However, its popularity is increasing even more these days. The result of that is that many people may come across a number of Indian terms whether in restaurants of even from friends and relatives that can’t help but describe the awesome meal they’ve recently enjoyed. Two such terms could be roti and naan. These are types of Indian flatbread that often accompany savory dishes. The confusion arises because there are many different types of rotis. Roti is somewhat of a more generic name that describes a variety of different types of Indian flatbreads. There are two prominent types of roti: regular and tandoori. The former has numerous types in itself, however all of these types have one thing in common; they are cooked on the tawa, which is a type of flat skillet. The second type of roti is the one that is cooked in a tandoor, which is a type of barrel shaped oven. The latter is known as tandoori roti. Naan, on the other hand, also started off as a generic name for any type of Iranian flatbread. However, today the term is primarily used in the context of tandoori naan, which is similar to tandoori roti. The primary difference between a tandoori naan and a tandoori roti is the fact that the tandooti naan is made from all-purpose flour, whereas the tandoori roti is typically made from whole wheat flour. Another difference is that the dough used for the naan is leavened, which basically means that it is been proofed with yeast or dough starter, i.e. dough from the last batch. The dough for roti is not leavened, which means that it does not use yeast. Some people also add milk to the naan dough; however that is primarily out of regional or personal preference, and is not particular common. The milk makes the dough extra soft, which is why some people also add milk to the roti dough. However, this is again not generally widespread. In general terms, a roti is a type of Indian flatbread that is made from whole wheat flour, which is locally known as atta. 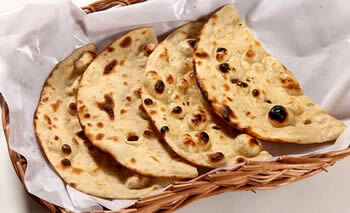 It a flat thin disk shaped bread that is a primary staple in most Indian meals. This is the most common and widespread type of roti to be cooked and consumed in every Indian household. Some people do tend to use all-purpose flour to make roti or a mixture of all-purpose and whole wheat flour. However, here unless the resultant dough is cooked in a tandoor, it would not be labeled as a naan. Coarser and less elastic and chewy.